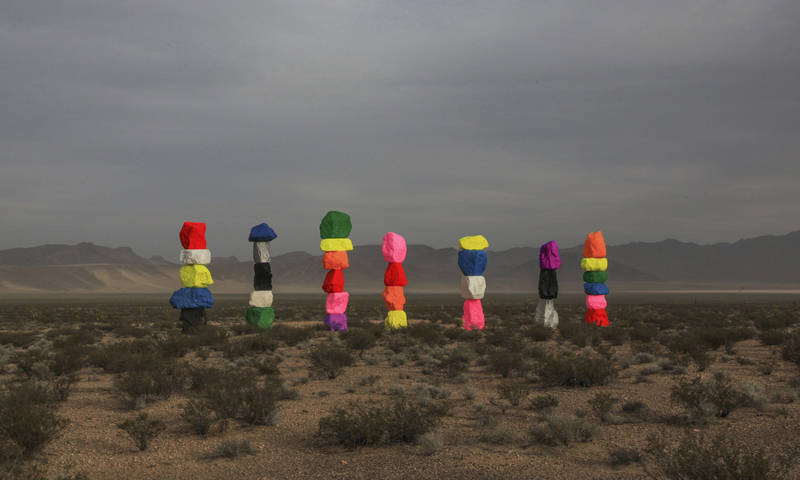 Ugo Rondinone’s Seven Magic Mountains art installation in Las Vegas. 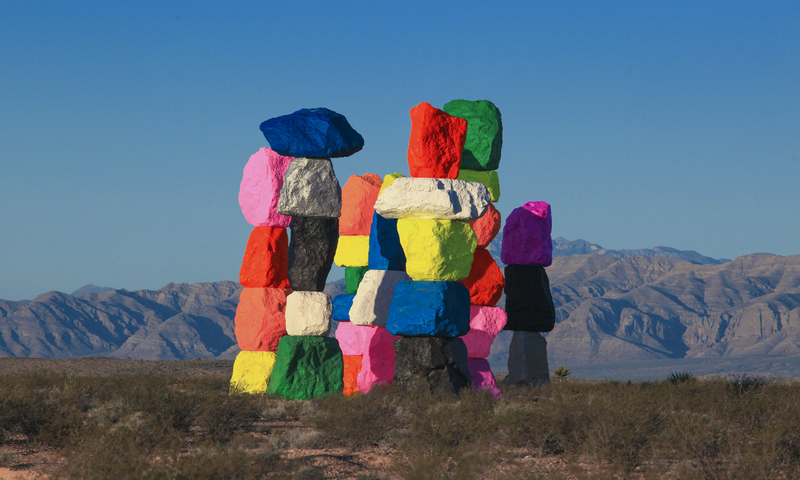 Internationally renowned Swiss artist Ugo Rondinone’s Seven Magic Mountains is a large-scale site-specific public art installation located near Jean Dry Lake and Interstate 15, approximately ten miles south of Las Vegas, Nevada. Comprised of seven towers of colorful, stacked boulders standing more than thirty feet high, Seven Magic Mountains is situated within the Ivanpah Valley adjacent to Sheep Mountain and the McCullough, Bird Spring, and Goodsprings ranges of mountains. A creative expression of human presence in the desert, Seven Magic Mountains punctuates the Mojave with a poetic burst of form and color. The exhibition opened May 11, 2016, and was originally scheduled to be on view for two years. 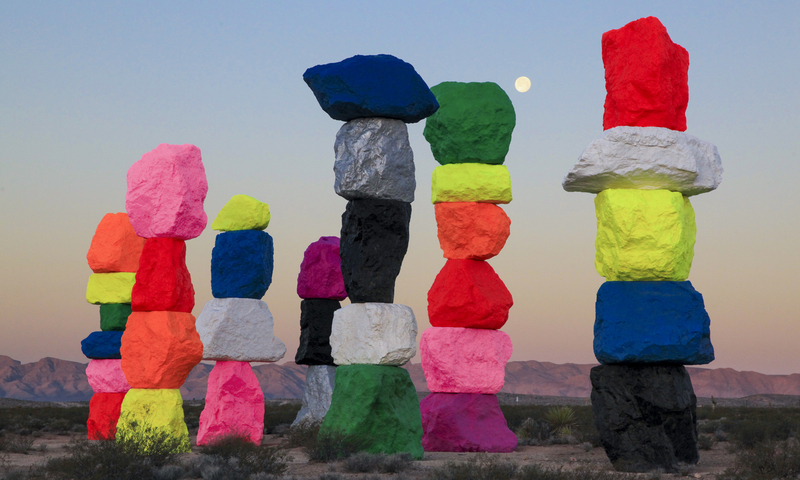 Due to the incredible success of Seven Magic Mountains since its opening, artist Ugo Rondinone has expressed a strong desire to explore ways to keep the artwork on view at its current site. The Producers continue to work on an extension plan that would enable Seven Magic Mountains to remain on view for several years into the future. At the end of 2018, the Bureau of Land Management (BLM) issued a three-year permit extension for the artwork, allowing the installation to remain on view through the end of 2021. Take your experience home by ordering official Seven Magic Mountains prints by Gianfranco Gorgoni.